Jo Hoeflok1, Liis Teene2, Emilie Chamma2, Dr. Ralph S DaCosta2. 1St. Michael's Hospital, Toronto, ON, Canada, 2Princess Margaret Cancer Centre, University Health Network, Toronto, ON, Canada. Presented at MHSRS 2014. Proceedings of the Annual Military Health System Research Symposium; 2014 Aug 18-21; Fort Lauderdale, FL, USA. Colorectal resections have a 4-25% acute surgical site infection rate, despite perioperative best practices for prevention. Repair of abdominal wall hernias carry risks for wound failure and infection. Management of wounds is resource intensive (~70% of home care visits). Care providers assess traditional markers for wound infection (pain, purulent exudate, crusting, swelling, erythema, heat) which are subjective and unreliable. 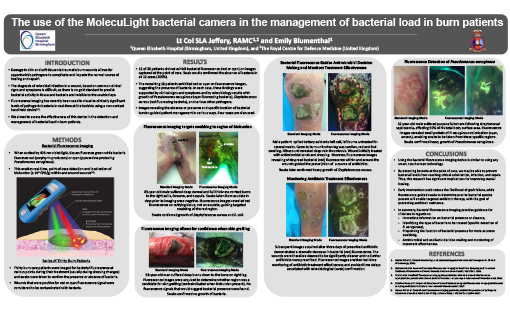 We developed a handheld fluorescence imaging device for rapid visualization and quantitative tracking of bacterial contamination, wound healing and connective tissue remodeling of surgical sites at the point-of-care, based on intrinsic fluorescence signals. Patients (n=7) with abdominal wounds (midline incision, ileostomy) from general surgery with unknown infection were enrolled in this pilot clinical trial (ClinicalTrials.gov ID: NCT01650571). 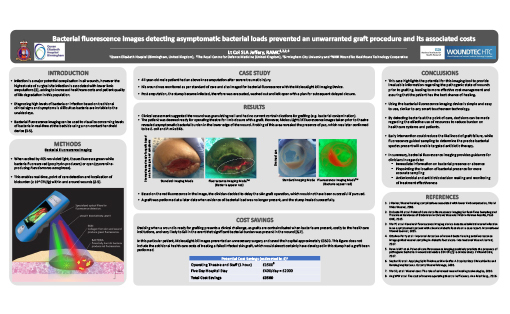 We evaluated the effectiveness for detecting subclinical bacterial contamination and guiding antimicrobial wound treatments when combined with clinical signs and symptoms (CSS) assessment. 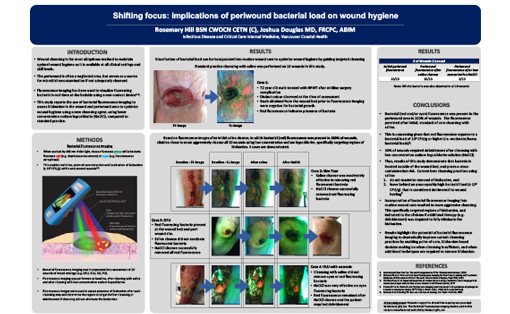 Patients were followed for up to 4 months to track and document progression of wound size and bacterial load in situ. Results show fluorescence imaging safely enabled real-time visualization of discrete and focal areas of (otherwise occult) bacterial colonization in large (>1000 cm2) midline abdominal wounds. 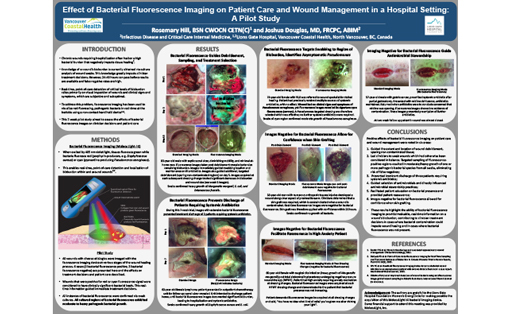 Fluorescence imaging allowed more accurate microbiological sampling of wounds with a sensitivity of 80% for detecting bacterial colonization, compared with CSS alone. This approach also confirmed the absence of bacterial colonization (specificity 70%) in symptomatic patients, thereby reducing likelihood of unnecessary antibiotic use. 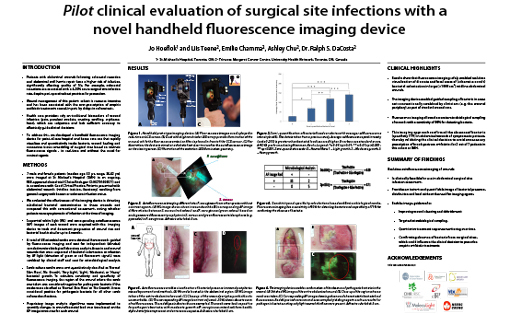 Handheld fluorescence imaging, used adjunctively with standard CSS at the bedside, enabled better detection of otherwise subclinical bacterial colonization in surgical sites. This enabled image-guided microbiological sampling and reduction of unnecessary antibiotic administration.